Fishermen have been using fish hooks for hundreds upon hundreds of years, and with the right education, today’s anglers have the best options to hook their game. Historically, hooks have been fabricated from natural materials like stone and wood and even bone. Today’s fishermen have the most durable hooks made from the strongest of steels. But every hook is not made equal and there are some things you need to consider before you buy a new set of hooks. First, think about the type of water you plan to fish in. Is it freshwater or saltwater? As you know, different fish thrive in different marine ecosystems. If your goal is to hook larger game, then larger hooks are generally better. The smaller sizes are more useful for smaller game. Just as different species of fish thrive in contrasting environments, you will learn that certain fish hooks work better than others for each unique kind of fish. The next thing you need to consider is your style of fishing. Some people prefer bait casting to fly-casting, and there are hooks better fabricated for that style. The very shape of a hook determines what it is most suited for. Finally, decide whether or not you intend to keep the fish you catch or if you are more of a merciful catch and release type. There are special hooks that are made for the catch and release hobbyists. Ideally you want to land the hook right in your game’s lip, rather than in its gut or inside its mouth. The Gamakatsu Octopus Hook accomplishes just that. The offset design makes getting the fish off the hook much more effortless than other hooks for sale. This one has a brazed closed eye and the tip is very sharp to pierce the toughest flesh. This steel hook is perfect for saltwater and is very hard to break. The red color also stands out so you can keep your own skin puncture-free. With the strength of this hook, you are sure to catch both big and small fish. Get ready for supper! Allow us to introduce the Gamakatsu EWG Offset Worm Hook. This world class, light wire hook is designed for your larger game. With an extra-wide gap, smaller fish aren’t necessarily your target with this bad boy. It’s made of forged and black anodized material and has a straight barb for quick removal from the fish’s mouth. The durability of the hook makes it tough to bend or break. Just be careful with this sharp hook, or you are likely to end up with an unwanted body piercing. Take this hook out in the saltwater and just watch the fish grab on to the hook. You will instantly see why this model has such great reviews. 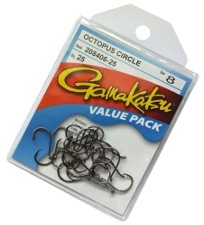 If you like your fish from freshwater one week and saltwater the next, then the Gamakatsu Circle Offset Octopus Hook is perfect for your tackle box. It’s a highly versatile hook. The design of this high-quality hook sits in the corner of the mouth, but you won’t want to set your hook with these. These are best used for steady pressure fishermen or those anglers that like to leave the rod in a holder and drink a beer until there’s a bite. Like the other Gamakatsu products, these are very sharp. Professional anglers have trusted the Japan-made Gamakatsu products since 1955. This brand truly does make the best fishing hooks. They are fabricated with only the strongest high-carbon materials and are the sharpest brand on the market. If you put these in your tackle box, you will be sure to come home with some fresh dinner. You truly can’t go wrong with any of these hooks.